Short term rental properties can be an extremely lucrative investment opportunity. In today’s modern world, many people are turning towards this type of property venture as opposed to long-term investment. We have a range of platforms and apps such as Air BnB that allow home owners to rent out their living space to holiday makers and those travelling for business. The legality surrounding this type of business is often mired in confusion and grey areas, however. 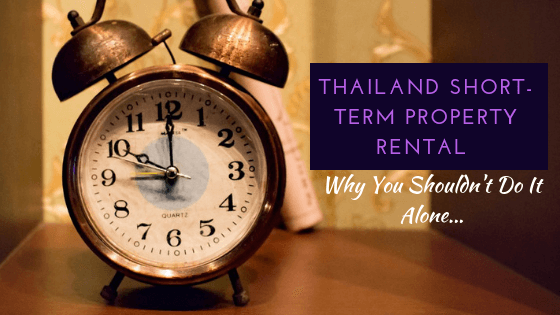 In Thailand, short term rental laws are ever-changing. To help keep up to date and ensure you make the right investment, we have provided information on this subject below. We look at the legality of Air BnB, how to rent condominiums, and the viability of short-term property rental in this country: Our advice is clear – renting out your investment short-term can work in Thailand, especially Bangkok, but it is highly recommended to use official channels and not to try and do it yourself. This is even more pertinent if you are based overseas. A court ruling in May 2018 demonstrated this law to the surprise of many people. In the Prachuap Khiri Khan province, the Wan Vayla Condo was found to be acting illegally – the courts ruled that as the condo hadn’t obtained a hotel operators license, they could only legally sell rentals of 30 days or more. This ruling coincides with the laws stated under the 2004 Hotel Act and applies to condos and short-term rentals through AirBnB. As a result, the Wan Vayla Condo was issued with a series of penalty fines with a final decision pending. For those who are currently renting their property through AirBnB on a daily basis, it could spell trouble. It all depends on how the Thai government decides to enforce this law. If local authorities decide to take a firm stance, it could effectively end AirBnB operations within Thailand. This is one big reason for our advice to use an authorised person / company. Is this likely to happen? Potentially – the government is receiving increasing pressure from the THA (Thai Hotels Association) to enforce the law and put a stop to the influx of AirBnB rentals that are springing up around the country. They claim that it is hurting both their own business and the tourism industry which is a major contributor to Thailand’s GDP. What can you do to operate a short-term rental property legally? It is actually possible to legally operate a short-term rental business if you are not a hotel. Obviously, you need a hotel operator’s license. This is a lengthy process however and there are strict criteria for your building to even qualify. Moreover, your building/condo must meet certain building regulations. In short, whilst we state it is “possible” it is not likely, especially if you are just renting out a room in your house – it is practically impossible to obtain a license in this instance. This is why the recent court ruling in the Prachuap Khiri Khan province has caused such a stir. What are the alternatives to short-term rentals? If you are worried about short-term rental opportunities in Thailand then there are alternatives. Long-term property rentals and investment continue to be a hugely lucrative option to the investor. Land prices, especially in Bangkok, continue to climb and the economy is growing. There are many condominiums and apartments in popular locations such as Bangkok, Phuket and Chiang Mai where you can create long-term rental agreements. If you invest in this type of property, you can rent it to locals, expats or even foreign business types who are staying in the country for longer periods of time. This will provide you with a guaranteed rental income and long-term financial gain. As the Thailand property market continues to experience steady growth; the value of your long-term investment will increase too. This means that in addition to the rental income, you could also sell it for a healthy profit in the future – especially if you are patient. In comparison to short-term rentals, the long-term alternative is not illegal and the process is relatively straightforward. There are even developers who offer guaranteed rental deals or buyback guarantees. For the immediate future, we consider short-term rentals as a generally unwise investment in Thailand unless purchased through authorised channels whereby a short-term management facility is available (example listings below). There is simply no guarantee that your business will be allowed to operate unhindered. If the laws change in years to come or the government is seen to relax their stance, it may be worth revisiting on an individual basis. Check out Ikon 77 – providing an efficient, legal and reliable short-term rental management scheme. Ideal for overseas property investors and hands-free investment.